Batchelors Way: Mudd room painted! 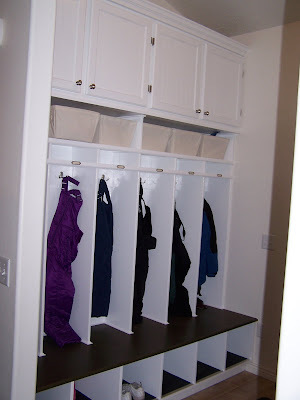 Love my mudroom, it helps keep us (my kids) organized. But it has needed some color since we finished it. Ta da! I finally painted the mudroom. I like how the yellow makes the cubbies pop. It makes me happy. This is the other side opposite the locker/cubbies. This side helps keep me organized. I use these hooks for my coat and purse. I never have to look for my purse. This board holds invitations, info about things on the calendar, and some schedules. When the event is over the info gets thrown away. And this is my life saving calendar. If it's not on my calendar it doesn't happen. Remember how all my kids have a color, well I use those on this calendar to color code each persons activities. Other wise no one would get anywhere. My mudroom is a very utilitarian room. But now it looks good with some color. Ok, so I absolutly just adore your mud room! Always have since the first time I saw it. I have dreams about having a space like that in my house (it'll never happen, hence the dream). Love how that white pops now. Another awesome project by the craftiest woman I know.